The third installment of the Streetsies concludes 2011 for Streetsblog NYC, but we still have a few days left in our year-end pledge drive. Please drop a donation in our bucket to help support Streetsblog and Streetfilms in 2012. Have a great New Year everyone. We’ll see you back here on January 3. What progress would New York City have made on bike policy in 2011 without City Council Member Brad Lander? Flash back to this spring. The Prospect Park West lawsuit had the tabloid press whipped into an anti-bike frenzy. A growing faction within the city’s political class found it advantageous to attack NYC DOT’s transportation reform efforts. And why wouldn’t they? With Democratic Party kingmaker Chuck Schumer reportedly upset about the new bike lane in front of his house, it seemed like any pol who stood up for safer streets was going far out on a limb. Against this backdrop, Lander defended the Prospect Park West project again and again. While other Democrats with local ties stayed off to the side or hopped aboard the DOT-bashing bandwagon, Lander made a stand. On the steps of City Hall, on the local news, in front of Brooklyn Supreme Court, in legal briefs submitted to Judge Bert Bunyan, he reminded everyone of the years-long public process that produced the PPW bike lane and the broad support for the project in his district. Lander’s defense of the PPW project would have been enough to earn him this Streetsie. Of course, he also stood up for pedestrian refuges on Fort Hamilton Parkway, spoke eloquently against NYPD’s irrational Central Park bike crackdown, and produced an excellent report about bus service on the B61. In March, the New York Times was ready to write Transportation Commissioner Janette Sadik-Khan‘s political obituary. Not so fast, Michael Grynbaum. By September, Sadik-Khan was announcing the most ambitious bike-share program in North America. Yesterday she delivered the news that New York City pedestrian fatalities are at an all-time low. The mojo is back. I might be a little partial but this award goes to Eric McClure and Aaron Naparstek of Park Slope Neighbors. For years they were out doing the gruntwork to make Prospect Park West a safer street: putting on public workshops, gathering signatures, and attending community board meetings. Then in 2011, thousand-dollar-an-hour attorneys and PR professionals parachute in and start lobbing grenades at the redesigned street, all because a few very well-connected people in the neighborhood didn’t like the result of that public process. Throughout the winter, spring and summer, Eric and Aaron went toe-to-toe, quote-for-quote with the NBBL war machine. You couldn’t ask for better people on the front lines. Seemingly on a lark, Ken Coughlin and advocates for a car-free Central Park mounted a hugely successful campaign that no one saw coming. Sure, this wasn’t the first time that a car-free park proposal won community board votes. But it wasn’t supposed to happen this year, not during a supposed backlash against livable streets policies. As one community board after another endorsed a car-free park trial, they confounded the whole backlash narrative. Getting cars out of NYC’s flagship park is just plain popular. By the end, more community boards signed on to the idea than ever before. While no car-free trial happened in 2011, the city started collecting traffic data that can be used to evaluate the effect of a car-free Central Park next summer. After many false starts and delays, Bike Upper Manhattan finally got an audience with Community Board 12 and NYC DOT to talk about adding bike infrastructure in their neighborhood. Brownsville residents are pushing for the neighborhood’s first bike lanes. Will the city stripe them? Brooklyn’s own Kimberly White, organizer of the first Youth Bike Summit here in New York, received a standing O after she delivered the closing address at the 2012 Safe Routes to School National Conference in Minneapolis. In this February segment, WPIX Long Island reporter Rob Hoell got all the juicy political details that Kramer, who holds the title “chief political correspondent” at CBS 2, left out of her report the previous week. Jason Gay writes a sports column for the Wall Street Journal, and he also penned this brilliant postmortem of the 2011 bikelash. You knew things were getting out of hand when the New Yorker published a column spouting nonsense about bike lanes, even if it was just on their website. Of all the responses to John Cassidy’s bike lane rant, Aaron Naparstek wrote the original and best, though I do think Adam Sternbergh got stiffed in the voting for this Streetsie. I thought the one about Chuck Schumer would take this prize. I was way off. Chuck is powerful, but he’s just one guy. It turns out that the most fascinating thing about NBBL is that they sought out an impressive collection of friends in politics and government to undo the public process that produced the PPW bike lane. Complete Streets: It’s About More Than Bike Lanes countered “bike bedlam” hysteria with gorgeous footage of redesigned streets and rational, informative interviews with transportation engineers. Someone please show this Streetfilm to James Vacca. Department of City Planning official Howard Slatkin admits that the Bloomberg administration uses parking minimums to buy political support for upzonings. Yankee Stadium garages go belly-up, further proof that the obscene amounts of subsidized parking at the new stadium were a total waste of taxpayer money. Martha Stewart invites Bike New York’s Emilia Crotty to the studio to share tips on biking to work. After Staten Island Republican James Oddo proposed environmental review for new bike lanes, he told Streetsblog that he wasn’t out to slow the growth of the bike network at all. He just wanted to call attention to what he sees as an overly restrictive environmental review process. Duh. Ian Dutton is leaving Manhattan CB 2 after seven years of service, decamping for Brooklyn. On the community board Ian was a strong counterweight to perennial NIMBY Sean Sweeney. During his tenure, protected bike lanes, public plazas, pop-up cafes, and performance parking came to SoHo and Greenwich Village. His efforts earned him the first Streetsie for Activist of the Year, back in 2007. One of the last projects he helped initiate and shepherd through was the conversion of the Hudson Street buffered bike lane to a protected lane. Manhattan’s loss will be Brooklyn’s gain. While it is great to see Brad Lander honored, and he really deserves it, it is beneath SB to call his B61 report “excellent”. It was lazy, statistically inaccurate, proved absolutely nothing with the few statistics provided, and made no concrete recommendations. 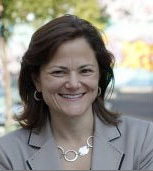 I really think Council Member Melissa Mark-Viverito deserves more credit for her work. Not only did she counter faulty logic used against the East Harlem bike lanes, but she was also an early, vocal, and persistent advocate that help begin the push for those lanes in the first place. In addition, I think Tish James deserves a mention, since she has pushed for a number of safer streets improvements in her district, including traffic calming on Classon Ave, Grand Army Plaza improvements, Nostrand Ave SBS, and the Putnam triangle plaza. She has also been a very visible and vocal supporter of bike share. Gale Brewer and Scott Stringer have done some good work mediating dissent around the Columbus Avenue bike lane, while maintaining firm support for the lane. They both also were key players in the push for a car-free Central Park. Other East Side electeds have made some great long-term strides, securing the East River greenway agreement with the UN, which will help create much-needed green space and a vital transportation link on the east side. The car-free Central Park gains would not have happened without then-CB7 chair Mel Wymore, who skillfully shepherded a trial closing proposal through his CB and then took it to Manhattan’s Borough Board. Wymore is now running for City Council. Thanks, Ben & Streetsblog. We wouldn’t be receiving the accolades if it wasn’t for the 400+ supporters who came out in a cold, driving rain on March 10th to fill the CB6 hearing on PPW, or the 700+ who came out for that awesome family ride on April 10th, or the thousands who every day enjoy the PPW bike path and the safer street it created. There should be a special award, also, for Deputy Mayor Howard Wolfson, who’s been a strong, supportive voice for livable streets both inside, and outside, City Hall. @BicyclesOnly certainly deserves recognition for the many hours he spent gathering signatures and support for the East Side Bikeway, tweeting updates from various Community Board Meetings, and the numerous photos he’s posted about life in New York City on two wheels, some of which appeared on Streetsblog. He’s been a real asset for the cycling community. I agree with Stacy. Steve Vaccaro has been huge this year, both with his advocacy and organizing work and with his legal work. He deserves major props. Just a follow-on of your comment about the Times’ Michael Grynbaum. Reading his piece about Transportation in 2012 shows his antipathy to bikes. Bike Share gets a “critics worry…” caveat while the removal of a cash payment option on the Henry Hudson Bridge is stated without any comment. As has been written elsewhere, Grynbaum only wants to write political infighting stories and seemingly cares little about the safety of our streets and the health of our people. Given the tremendous loss of life on New York’s streets, I’d say Grynbaum’s focus is irresponsible and unethical.